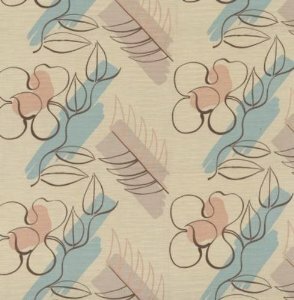 I do love a chance to wax lyrical about the wonderful Persephone Books, I have blogged about my love of them before. 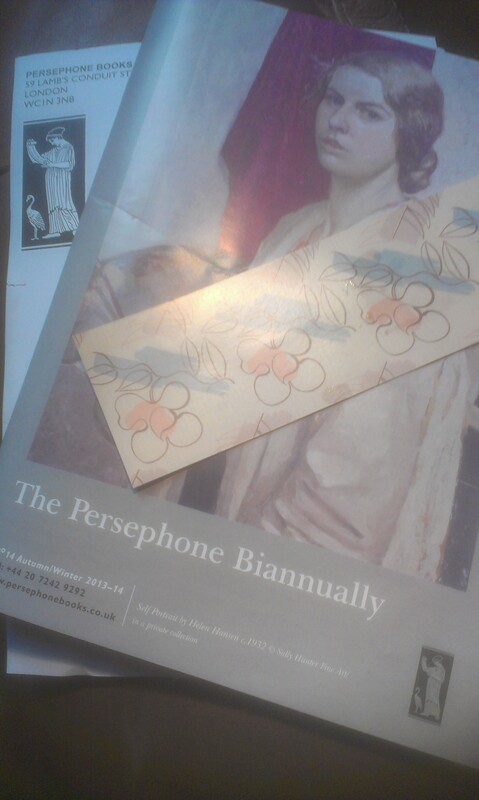 This week the Persephone biannually arrived at my house – always a joy to come home to on a rainy afternoon. It’s a time when I brew up a mug of tea, push my tired feet into cosy slippers and get stuck right in. I (or rather heavenali) even get a couple of mentions in this edition. There is an extract of one of my Persephone reviews ‘Farewell Leicester Square’ – I’m always rather thrilled to have my reviews featured in the Persephone biannually – I love the ‘Our bloggers write’ feature in the magazine – it really shows how book bloggers are becoming a part of mainstream reviewing. In this biannually there is a lovely short story by Rose Macaulay called ’Miss Anstruther’s letters’ the rather poignant story of a middle aged woman writer, scrambling through the debris of her bombed out London flat in 1941 desperately searching for twenty two years’ worth of letters which she knows can’t possibly be there. I loved this story – it may stay with me for some time, and has served to remind me that I have had a Rose Macaulay novel sat unread on my shelves for some time. 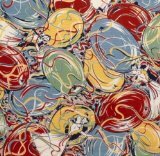 Inspired by the arrival of Persephone book number 103 The Squire by Enid Bagnold – Lynne Hatwell – aka Dovegreyreader writes about the changing experiences for women having babies. It’s an excellent article, written by someone with a wonderful understanding of maternity care. The Squire is the first of the two latest publications from Persephone – I actually already have a copy – a Virago Modern Classics edition that was given to me by my friend Liz. I have so many VMC’s tbr – I’m sure though it will float to the top one of these days. The second of Persephone’s latest publications is the hugely anticipated The Two Mrs Abbotts, by D E Stevenson; the third in the Miss Buncle series. I simply couldn’t wait for it – so almost immediately after I finished ‘Miss Buncle Married’ – I ordered ‘The Two Mrs Abbotts’ from the library – it took six months to arrive at my local branch, of course I read it immediately. Naturally as I have the first two Miss Buncle books in lovely dove grey covers I will have to acquire a copy of ‘The Two Mrs Abbotts’ just to keep. For any fans of the first two Miss Buncle books I heartily recommend it. I expect we shall see it appearing in several people’s Christmas stockings this year. Two wonderful new offerings from Persephone Books I think, which I am sure will prove very popular indeed. I got that bookmark too! Did go through the catalogue and have spotted some books I wouldnt mind picking up, including afore mentioned “Two Miss Abbots”, along with getting my own copy of High Wages. There are other books circled in the brochure and I need to consider what I do in the run up to Christmas (wink wink). And of course they mention you in the piece about the two Mrs Abbotts book. I will be doing a London buying trip this autumn, combined with visiting my friend Emma’s new house, so orders can come to me and save postage! PS, I’ve actually tweaked the title of my own book blog to see if it will make them more likely to publish an extract from one of my reviews (sad or what). 🙂 no not sad at all – good idea. Marvelous! – hope you be able to carry them all? Ooooh, I’m jealous – mine hasn’t arrived yet!! I also have The Squire in Virago, but I’m very please about the Two Mrs Abbotts as I hadn’t tracked down a copy. It *is* lovely how book bloggers can be taken seriously – well done on being featured! I’m sure you’ll find The Two Mrs Abbotts is worth the wait. I haven’t yet read my copy. It’s waiting for tea and scone time tomorrow afternoon. Now I know you’re mentioned in there I shall look forward to it even more. 🙂 ooh thanks Alex – I hope you enjoy your read of it. Ooh, this means mine will be on its way! Can’t wait to read it and see your mentions – congratulations! One of things I’ve learned since I started reading blogs is this “Persephone” phenomenon. I can’t help but be struck by how fantastically enthusiastic you and others are about these books. Persephone remains for me a bit like Russia – I know a lot about it, I read a lot about it, but I’ve never been there. But I really like the short glimpse of Miss Anstruther’s Letters you’ve set out above. I’ll take the plunge and visit their bookshop on my way home one night (as I pass through Holborn). Any suggestion on the best one to try first? oh my that’s a bit tricky – I suspect you might like one of the darker books or even one of the non-fiction best. The blank wall and The Expendable man are brilliant, as is Manja, and Harriet. If you fancy non-fiction I could recommend On the other side: letters to my children or The World that was ours. Full descriptions of the books can be found on heir website, and I have writen reviews on the above titles too. Thanks for these – I’ll use them as my Persephone shopping list of possibles – though I’m drawn to The Expendable Man – it somehow resonates with my own life as a man living with a partner and daughter who have a secret language and life called “Fashion and Clothes!” that I only briefly connect with when I stand outside said fashion/clothes shops!!!!! It’s a remarkable novel I think. on October 20, 2013 at 1:32 pm | Reply A.M.B. I think book bloggers are being credited more and more these days. Persephone is such a great publishing house! And extra bookmarks are always a welcome addition to my house.